The Gyreum is aptly positioned for your tour or group to explore the layers of history round and about. We can organise highly academic and / or highly amusing guides to help elucidate and entertain the mysteries; sometimes a mixture of both. Heapstown Cairn formed over the Well of Slaine is the equal of Newgrange, Knowth and Dowth. This well is sometimes referred to as Loch Luibe, latter means herbs. This is where the 365 herbs of Ireland sprung from. 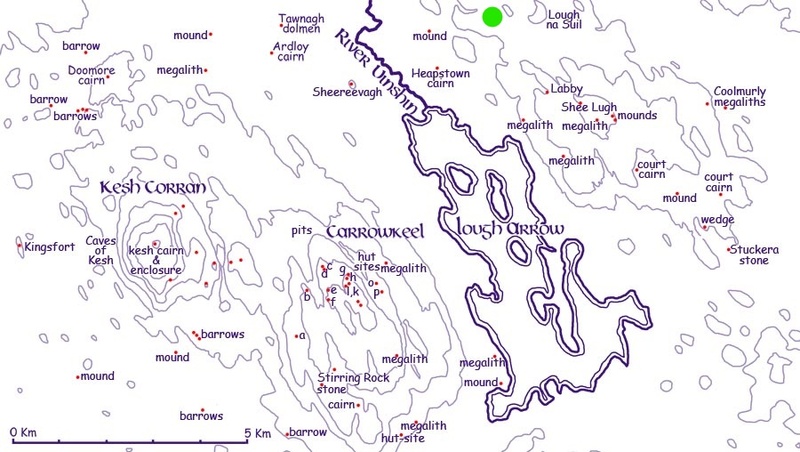 The green dot is the Gyreum – west of Lough na Suil formed when Balor’s single eye burnt a cometeen sized hole in that upland. To our further west is the Well of Healing hid beneath Heapstown cairn.